Wendy's is in the midst of an arms race with McDonald's. That's not just about Wendy's constantly attacking the Golden Arches on Twitter and in actual commercials. Both restaurants have been offering increasingly alluring promotions through their mobile apps in an effort to get people to download. This month alone, McDonald's is offering free fries every day (with a minimum $1 purchase) and $1 sandwiches every day. Both of those were announced before Wendy's launched an in-app offer for a free Dave's Single every day in September as long as you make some kind of purchase. (So, you can get a soda and a free burger.) Now, Wendy's has launched another freebie. 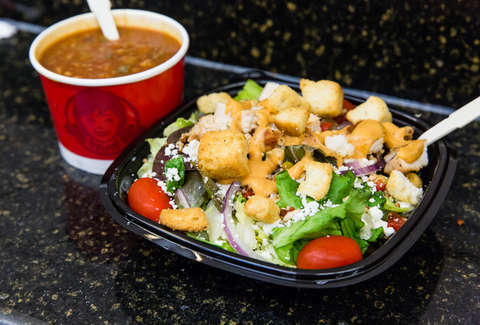 It's welcoming autumn with a free half-size salad with any purchase, available through October 7. That deal includes the just-launched Harvest Chicken Salad with seasonally-appropriate fixin's like brown sugar walnuts and apple cider vinaigrette. Also, currently sitting in the Wendy's app are deals for a buy-one-get-one-free chicken sandwich, a $5 Dave's Double Combo, and a $1 Jr. Bacon Cheeseburger (both good through September 23). It's not a bad time for people who are down to eat fast food on the regular. Now you can even mix it up and not go for a burger and fries, again. It's not exactly like making a fresh salad yourself, but, on the upside, you don't have to make it yourself.